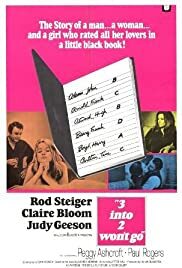 Steve Howard, a British sales executive living in Middlesex, England, begins an affair with a young hitchhiker, Ella Patterson, to emotionally get away from his marriage to his wife Frances. But when Ella moves into a room in Steve and Frances's house, he must keep the true nature of his relationship with Ella under wraps at all costs. This drama is OK, nothing more, but it features a rather depressing storyline. Married man meets, beds, and impregnates a drifter, and we see the impact on his marriage. Added note: Try to rent the video. When NBC showed the movie on commercial television, the network added additional scenes featuring a social worker looking for the drifter, and the man's co-workers. These scenes are not outtakes from the original movie that NBC restored, but new scenes that NBC filmed and added to make clearer the backgrounds of the characters. They are unnecessary and rather insulting to the audience that the network felt they needed to "improve" the movie.